The Penguin may be Batman’s enemy but he certainly won’t be yours if you win big off one of his respins in this online slot game. 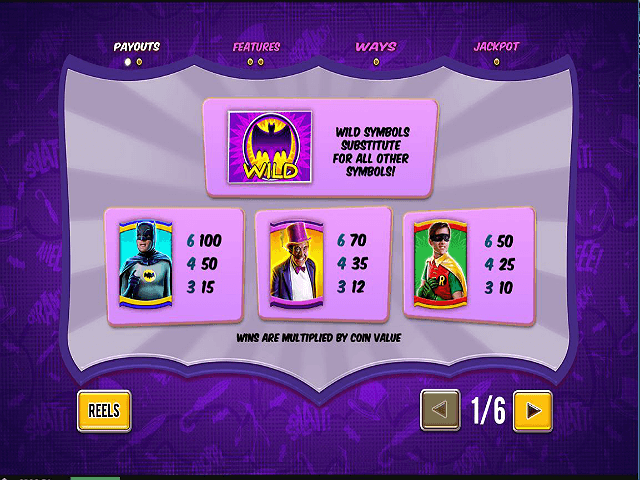 Based on the original 1960s Batman TV series, this retro-themed slot from Playtech is part of the DC Super Heroes series which includes other Batman titles as well as other classic DC superheroes, such as Superman. This isn’t just any old branded slot game, though. In this review we’ll take you through what makes the game stand out, its features and the different ways in which you can win! 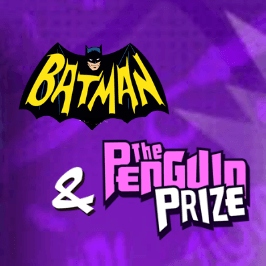 Play Batman and the Penguin Prize for Real Money! This is Batman, but not the darker, more macho figure from the modern blockbuster movies. 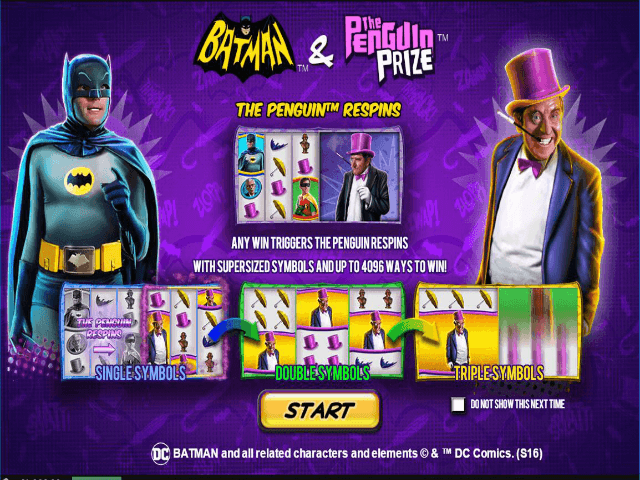 Instead, when they open up the game, players are greeted by the 1960s TV character in his original Batsuit alongside the Penguin in his original costume. Batman and Penguin also make up two of the symbols on the reels along with Robin, police chief Clancy O’Hara and the Penguin’s hat and umbrella. There’s a retro comic book feel to the game, complete with a retro soundtrack. 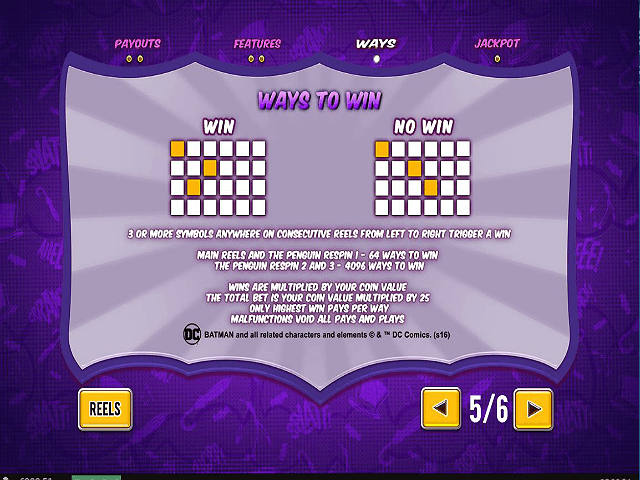 As for the game itself, Batman and the Penguin Prize is a somewhat unusual slot game, consisting of six reels, four rows and 64 ways to win. The game can be played on all devices from 25p to £125 per spin. While the other games in Playtech’s Batman slot series come with a number of extras, there’s only one real extra feature in Batman and the Penguin Prize. When you land on a winning line in the main game, it triggers the Penguin Respins feature which kicks the Penguin into life as you try to help Batman overcome his arch enemy. During the main game there are only three reels but when the Penguin Respins feature is activated, another three are unlocked and you get the chance to play through three levels of the bonus game. Respin One takes place on the second set of reels with extra stacked symbols. Any winning combination here triggers Penguin Respin Two which is played out on a six-reel, four-row machine with 2x2 Super symbols, increasing the number of paylines to a whopping 4,096. If you’re lucky enough to win in Respin Two, you then progress to a final respin. Penguin Respin Three also offers 4,096 ways to win but comes with 3x3 Mega symbols which can deliver some, well, mega payouts. After the third respin is complete or following any unsuccessful spin, you’ll return to the base game. Anyone playing Batman and the Penguin Prize has the chance to enter the DC Super Heroes Jackpot, a multi-level progressive jackpot linked to all the DC Super Heroes games. A small percentage of each bet placed goes into the jackpot, split between the four levels: mini, minor, major and grand. The jackpot game can be triggered randomly after any spin in the main game and entering it guarantees a win of one of the four jackpots. 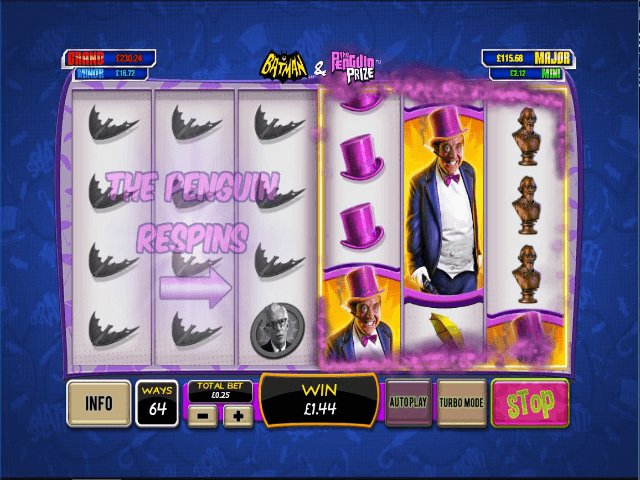 Batman and the Penguin Prize may not offer as many features and bonuses as other Batman titles such as the Joker Jewels but fans of the classic TV show will love the look of the slot game, and the Penguin Respins feature offers a huge number of ways to win. Share this Batman and the Penguin Prize Review today! If you like Batman and the Penguin Prize, you'll love these slot titles too!